There are so many ways to support your fellow artists. If you can’t afford to buy their original art then maybe you could purchase a print or other item with their art on it like cards or tote bags. Another really helpful option is to share their website links or social media posts on your own pages. Artists are always grateful for that last one! You could also tell an artist how much a particular piece touches your heart. I know a lot of us have done some or all of these things but earlier this year I had the opportunity to support a local artist in one of the most interesting ways I’ve ever done. Let me explain why I was so honored and happy to accept this unusual request for support! In March, Linda H Clark (of Sassie Selfies fame!) and I were contacted by friend and fellow colored pencil artist, Pam Gassman. She wanted our assistance as models for her next piece. 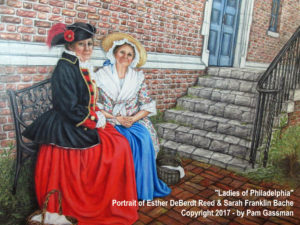 Her recent artistic focus has been in creating an extremely impressive portfolio of work that features female figures from the US colonial period. But her talent and skill don’t stop at the drawing table. She actually sews the authentically accurate period costumes her models wear for her source photos! The clothing pieces are works of art in themselves. Her passion for U.S. history combined with her incredible talent for making them come alive with her colored pencils made agreeing to do this an easy decision! 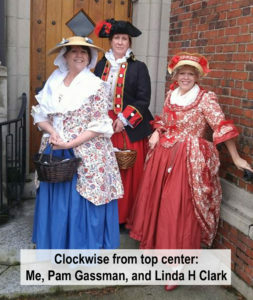 After donning our respective outfits, Linda, Pam, and I walked around Tacoma, Washington in our beautiful, colonial garb while Pam took lots of photos at various locations. (I will tell you that it took a while to get all those layers of clothing on because Pam is a strickler for detail. As much fun as I had wearing those costumes it made me very grateful for our modern day jeans and t-shirts!) Here and there we stopped to strike a pose while her camera clicked away. Of course, the whole time we were laughing and having a great time. Who knew supporting a fellow artist could be such a blast! I loved watching the reactions of everyone around us. People would either stop and stare or try to ignore us and pretend that seeing 3 women walking down the street like they just stepped out of the 1700’s was nothing unusual. We even went to a restaurant in our outfits . . . just 3 gals having lunch in our laced-up bodices and big skirts! It was so much fun! A little girl in the restaurant even asked to see our clothing up close and Pam took out a bookmark with her art on it and gave it to her. She was thrilled. Of course, all good things come to an end and we returned to her house and to the year 2017. Linda and I had such an adventure thanks to Pam. During the afternoon I had completely forgotten we were doing this so she could draw from her photos. Initially, I really wanted to do this to support my fellow artist in her project but I think I am the one that left inspired! And after seeing what she created from our trip back in time we were even more thrilled to have been a part of that day! So, support your fellow artists because it could be fun! What are some of the most unusual and fun ways you have either been supported or supported another artist?